kingsrevival.org » The Patient Potter! But life can become a little more simple…and a little more easy when at least one person in our life has patience. Among the many characteristics of God, I am so glad that our God practices patience. We cannot make God tired. He is slow to anger. That his love endures forever. His grace is boundless. If our God was not patient, we will never be able to experience the rest of his characteristics. He looks at us and waits for us patiently not just when we accepted him as savior, not just when we took water baptism, but daily. Some of us know that we need God’s patience every day…and some of us know that our husbands and wives need OUR patience every day (haha). I’m happy that we are in the hands of a patient potter. Isaiah 64:8, says: “O LORD, thou art our father; we are the clay, and thou our potter; and we all are the work of thy hand”. We are the clay and God is our Potter. During my childhood in India, I remember visiting a potter. We have places in Arizona where you can go and make pots and mugs as well. It is not an easy task and it takes a lot of self-control and concentration. While the wheel is spinning, he shapes and make pots of different shapes and sizes. The simple clay was placed in the center of the wheel and with added water and patience, pots are shaped and formed into vessels. All vessels are not alike. Each vessel is unique in some way and is designed according to the need. Each vessel is important. No vessels were created that were not useful or needed. Today, I would like to share with you what God has laid on my heart about the simple truth of our Patient Potter. 1. Water the process – The beautiful things of life are formed from simple ingredients. Water is the most essential part of this process. If he does not add enough water into the clay, the clay will remain too hard and rigid for him to be able to actually use. When the water is added into the clay, it makes the clay soft and PLIABLE (or moldable not flexible). If the clay is not soft and moldable enough, the potter cannot begin to use it to make the pottery he wants to make. God’s word is the symbolic of “water” in the bible. Ephesians 5:26, ”He might sanctify and cleanse it with the washing of water by the word, that He might present it to Himself a glorious church, not having spot or wrinkle or any such thing, but that it should be holy and without blemish.” The word of God is like water to our souls. Our spiritual body needs God’s Word flowing through us in order to feed us on the inside. Only the Word will help to mold and transform us into a better person. If you do not spend enough reasonable time in this life trying to read from the Bible and integrate the actual knowledge that is in this Book as best you can, then God will have very little to work with in your own personal growth with Him, and you will see very little, if any actual spiritual growth in Him in this life. Allow God’s Word to penetrate into every fiber of our being to become what God has planned us to be! Water illustration: Have you ever wondered how popcorn pops? Every kernel of corn has a microscopic dot of water in it. When you put the bag in the microwave or in a pot, the pressure outside heats up the microscopic dot of water on the inside and it begins to move and vibrate and push against the outside and within a second it pops to a completely new appearance. The Word of God which is like water must be laid in your heart. When filled with the Holy Spirit, He begins to move and change your inside because you have hidden the Word of God inside your heart. When this happens, your life is transformed from the inside out! You see, because any change from the outside to inside is difficult and temporary…but when change happens on the inside, it always shows up permanently on the outside. 2. Remain in his hands – If we do everything correct but “remain” in God’s hand then we have lost it all. The clay is of no value if it is not in the hands of the potter. Sometimes the vessel becomes marred. The potter reshapes it again and again and works out the marred places in the vessel. 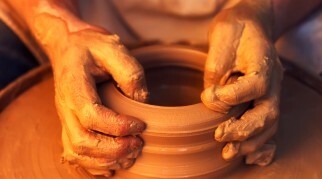 The clay is never thrown away by the potter. The potter always touches the clay carefully giving it a new shape and form. Likewise, we are always protected in the hands of God. Psalms 41:2 “The LORD protects and preserves them, they are counted among the blessed in the land, he does not give them over to the desire of their foes”. He will never throw us away or give up on us, but he will carefully give us a new shape and structure and fill our lives with full of hope! In the New Testament Jesus says to remain in Him as he remains in God.., “No branch can bear fruit by itself; it must remain in the vine. Neither can you bear fruit unless you remain in me” John 15:4. As we remain in God and allow Him to mold us then we are enabling ourselves to bring forth the fruits which God intends! The biggest problem our churches, pastors and leaders face today is that, they forget to remain in the hands of God. The greatest joy is to know that the Lord is building our lives on a day-today basis, if we remain to be centered at the will and purpose of God almighty! God is a patient potter, He does not give up on anyone that easily. We might have slipped away from His hands a hundred times but He is still ready to give us a new shape and meaning to our LIFE!